1 Rinse the squid, pat dry and cut into bite-size pieces. Rinse the lemongrass and halve lengthwise. Rinse the chilies, slit lengthwise, remove the seeds and white ribs and finely chop. Peel the galangal and cut into fine julienne. 2 In a saucepan combine the fish stock, galangal, lime leaves and lemongrass to a simmer. Add the spice paste and simmer for about 10 minutes. 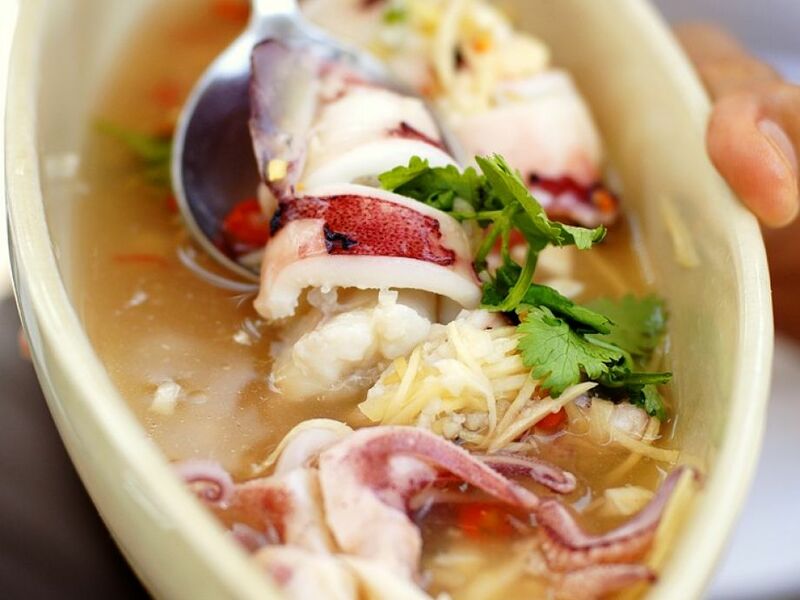 Remove the lime leaves and lemongrass and add the squid and the chilies to the soup and simmer 5 minutes. Stir in the fish sauce, soy sauce and lemon juice. Serve in bowls garnished with cilantro leaves.